This 10mm Beveled Tungsten Ring is polished and has a shine that will last a lifetime. 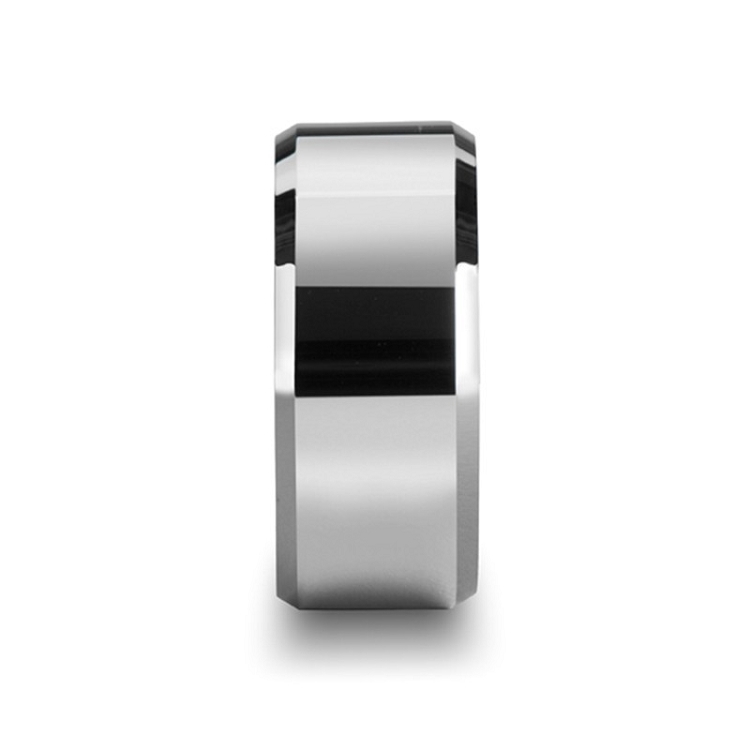 This is a bulky, masculine tungsten ring that is sure to stand up to a guys guy type of man. There is a second photo on here that looks as if there is a line going thru the ring, but that is just the reflection, the entire ring is one polished color. This style also comes in a 4mm, 7mm and 8mm. Features: High scratch-resistant tungsten, four times harder than titanium. This tungsten ring is comfort fit contoured on the inner surface for a more comfortable fit. Completely hypoallergenic, out tungsten carbide rings will never turn your finger green or cause irritation to your skin. Was this answer helpful? 38 of 41 Customer(s) found this Answer helpful. Q: This ring is so thick, should we order our normal size or adjust it? A: Order the same size that you were sized it. Our rings are comfort fit to no matter what the width, these rings will fit perfect and very comfortable. Q: Will this ring Turn black and make my finger GREEN? This ring or any other ring we sell will never turn your finger green. Cobalt is what turns your finger green, the rings we sell are all Cobalt-Free. This ring and every other ring will never turn color, tarnish, bend or scratch. If it does, we replace it. Tungsten should last forever. Happy shopping and hope this helps! Q: Is ther a big difference between a mens' size 8 to a womens'size 8? A: You can make different size incase someone prefer it a little thinner but for me, it was what I wanted. Q: will this ring resist scratches? A: Correct. All the tingsten rings we sell our scratch resistant! I have been wearing Tungsten rings for a long time now. They are heavy and demand respect. 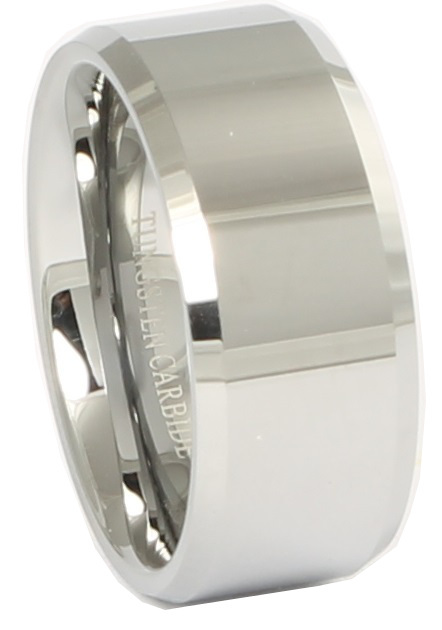 If you are looking for a flashy tungsten wedding band you can't go wrong with this ring. I have purchased rings from here before and was very satisfied,so I purchased another on. Very pleased with the service and quality and the price is great! My ring came in quickly, it looks great, fit is right on and very comfortable. Highly recommend Tungsten Fashions. I work in the Maintenance field so my hands take a beating. So far not even 1 scratch to my ring and it's been exposed to dirt, oil, tools, you name it. Fantastic ring and the price for something that will last forever or be replaced at no cost is amazing! Purchased this ring as a replacement to a well worn, abused wedding band. Have had the ring 2 weeks. Has been placed under a large amount of stress and abuse. Ring looks flawless still. Not a scratch to be seen. This is a beautiful ring. Thick size, nice appearance. After buying 4 rings from Tungston I personally think these are the best ever made. Love all 4. Very high quality for an unbelievably reasonable price. My husband loves the size, density and quality of the ring. He prefers the thicker band so this suits him well! Nice ring. Fits as expected. Solid. Heavier than I expected, which is a plus. I have always wanted a wide band wedding ring. This ring does not disappoint, the craftsmanship and quality of the ring I received it simply stunning. It is more than I expected, especially for the price. Thank you, very satisfied customer! This ring is perfect if you are going for a bold look. It is thick, wide, heavy and very durable! Arrived on time as expected. Fits beautifully. Looks much more valuable than it costs. Like the discounts. Have a wish list for several others. Awesome site. Excellent service. My intentions were to email you guys and let you know how satisfies I am with it. Great quality and awesome look. It's exactly what I've been looking for. Prior to me ordering, I had purchased two others from a jeweler, after your item came in I immediately returned the others. I had made my choice. Thank you so much for creating this product. Great quality fit and finish are prefect. This ring is huge, width wise, it is for someone looking to make a statement, So for me it is exactly what I was looking for and it gets a lot of looks and likes. I am extremely satisfied with my purchase from Tungstenfashions.